Collins Booksellers - A Brief History of the Saugeen Peninsula by David D Plain, 9781490788692. Buy this book online. 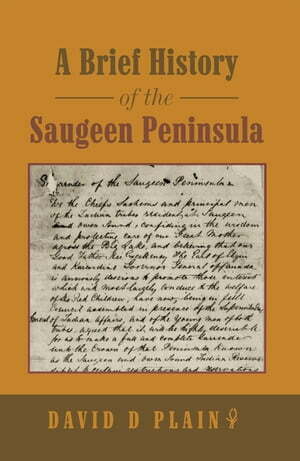 A Brief History of the Saugeen Peninsula is historical non-fiction and as the title suggests it is by no means exhaustive. It is a treatise that presents the history and culture in broad strokes covering the early history of the Anishnaabek (Ojibwa) of the Saugeen (Bruce) Peninsula as well as their relationship with the Crown during the colonial period of Upper Canada. The first section of the book highlights the historical periods of the settling of the peninsula by the Ojibwa through the War of 1812. This is followed by the treaty-making era and relationships with missionaries. The historical section finishes with the paternalism of the early days of the Indian Act through modern times. The second section of the book gives a glimpse into the culture of the Anishnaabek. Topics such as Ojibwa characteristics, language, religion, and trade. Band designations, wampum and dodems are explained as well as gatherings, games and stories. Lifestyle is also covered illustrating the cyclical movements throughout the territory following the seasons from the main villages to hunting camps in winter, to sugar making in the early spring, to the fishing camps in late spring.